To install the DSL Forge, go through the following steps. To know which package is the most appropriate for you, select one of the following alternatives. If you want a closer integration with Xtext and EMF, or if you want to integrate the editor with other Eclipse components, you’d better install Eclipse for RCP and RAP Developers. This makes it possible to integrate the editor with third party RWT (Remote Widget Toolkit, the web-based SWT) plugins and widgets. Done! Start developing a web front-end for yout DSL! By default, the Eclipse IDE compiles all projects in the workspace against the running platform, sometimes the IDE itself, sometimes not. RAP applications are compiled against the Equinox Basic Target. More info about setting targets can be found at the Eclipse RAP Developers Guide. There are two ways to set the target: you could either import the base target platform (may contain features you are not interested in, but everything is there to run the examples), or use the generated target platform. From version 0.9.x, DSL Forge Xtext/RAP Generator generates a target platform per-DSL. Open the target file (e.g. neon.target) and let P2 do the rest (this may take a while). 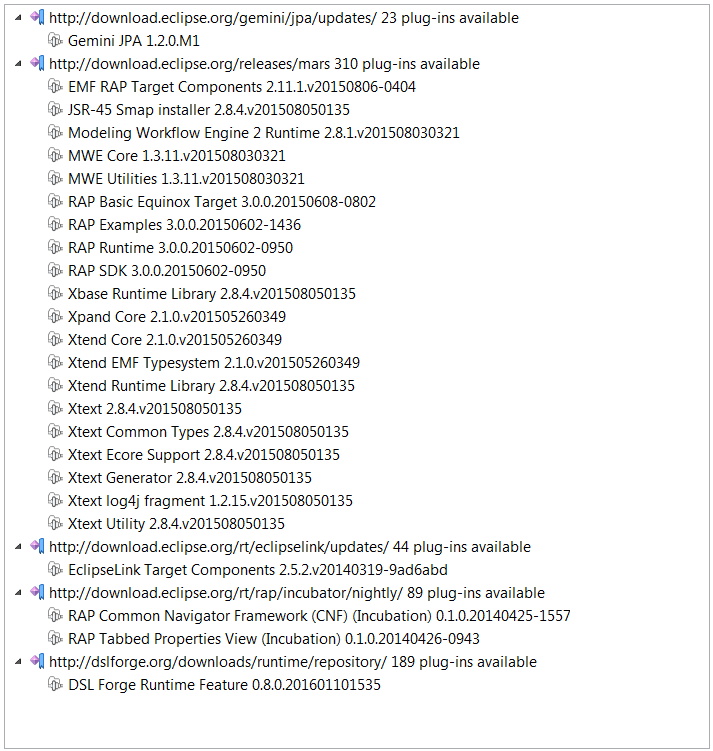 Below an example of a target platform which, in addition, uses some of the RAP Incubator components (Tabbed Properties View, Common Navigator), Gemini JPA and EclipseLink for persisting resources metadata. Activate the target platform by clicking the link “Set as Target Platform” in the upper right corner of the target editor. You’re done now, let’s start with a first DSL example!